There are thousands of new apartments being built around the DC area today, and most of them are high-cost “luxury” apartments. But they likely won't stay that way. 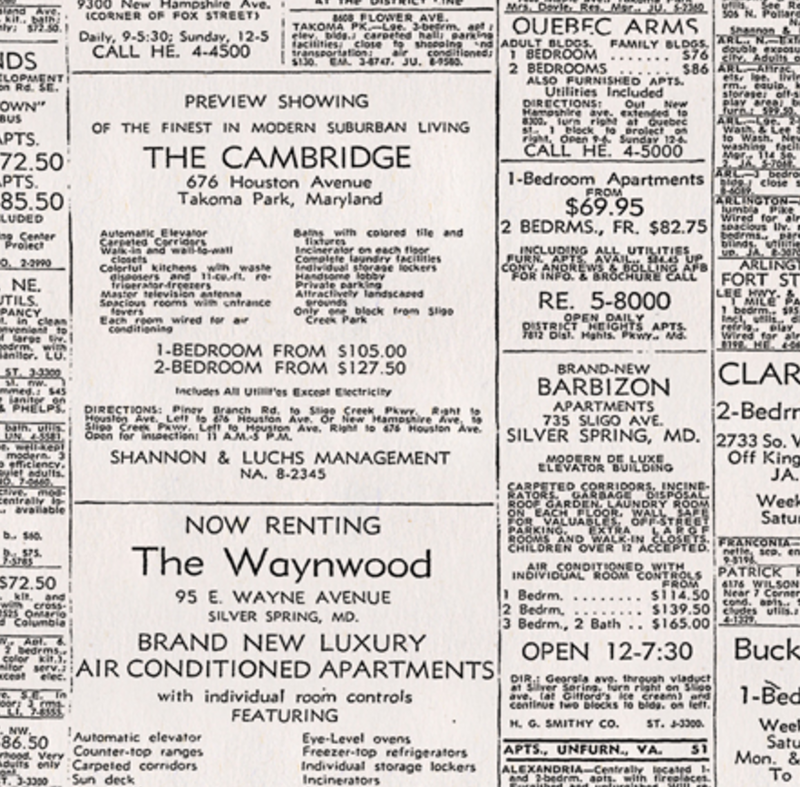 A look at 1950s rental ads shows how yesterday’s luxury housing became today’s affordable housing. 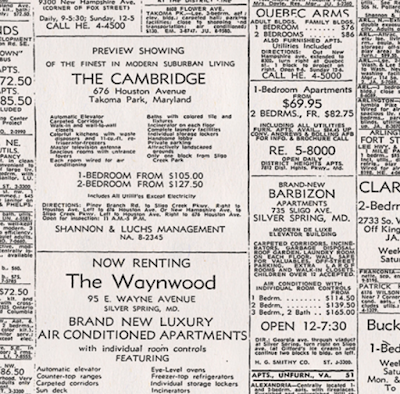 Part of the rental ads in the November 18, 1958 edition of the Washington Post. Image from Richard Friend. 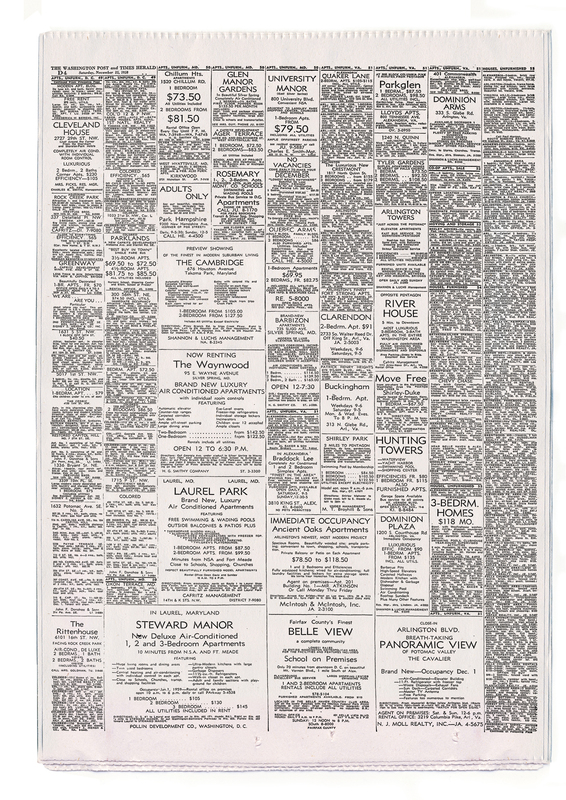 Here's a portion of the classifieds of the November 15, 1958 edition of the Washington Post, courtesy of local graphic designer and historian Richard Friend. There are ads for apartments all over the DC area, including a bunch of then-new apartment complexes in Silver Spring and Takoma Park. 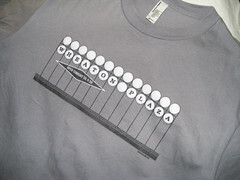 These were the nicest apartments you could rent at the time, and the ads marketed exclusivity. Many of the ads refer to “ADULTS ONLY” apartments, free of the noise and disruption of kids. None of the Montgomery County ads seem to reference race, though there are several ads for “Colored” apartments in DC. Of course, these practices are illegal today due to the Fair Housing Act of 1968. Sixty years later, many of these complexes have now become housing for working-class families. Some of them are subsidized by the government, which is an important way of providing affordable housing. The Cambridge, on Houston Avenue in Takoma Park, which offered the “finest in modern suburban living” in 1958. Today, it’s maintained by Victory Housing, an affordable housing non-profit, and there are maximum income requirements for residents. The Barbizon Apartments in Silver Spring. This was luxury housing in the 1950s, but today it's affordable housing. Image from Google Street View. Or 7620 Maple Ave, also in Takoma Park, whose ad said that “never before and never again” would there be “beautiful De Luxe” apartments available at that price. That building, now called the Franklin, is now reserved for low-income disabled and elderly residents, though it did get HUD funding to do environmentally-friendly renovations a few years ago. Other buildings are what we’d call “market-rate affordable,” which means that the prices are simply lower because there are other options available. The Waynwood, on Wayne Avenue in Silver Spring, offered “BRAND NEW LUXURY AIR CONDITIONED APARTMENTS” in 1958. Today, it’s a condominium called Kenwood House where units typically sell in the $100,000s, well below the median sale price of $422,000 in that zip code. Economists like to talk about a concept called “filtering,” in which homes built for wealthy people become homes for less affluent people over time. These buildings were all “luxury” buildings in their time, but as new homes took their places, the landlords weren’t able to compete and instead rented to tenants who could pay less. You can see filtering at work in Silver Spring. 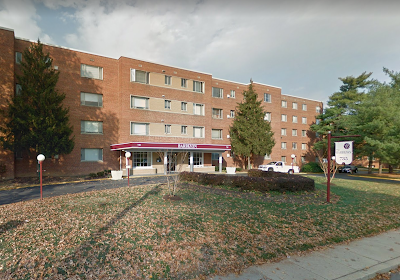 Today, a one-bedroom at the Barbizon, a 1950's apartment building on Sligo Avenue in Silver Spring, rents for $1,500 a month. Meanwhile, a one-bedroom at Eleven55, a new “luxury” building a few blocks away, rents for about $2,000 a month. Yet these apartments were still cheaper in 1958 than they are today. That same one-bedroom at the Barbizon offered 1 bedrooms for $114.50 in 1958, or about $967.50 today. That’s because we built a lot more new homes in the 1950s and 1960s, when Montgomery County was experiencing a population boom due to people moving to the DC area, and people (mostly white and middle-class) leaving DC for the suburbs. The county doubled in population during the 1950s, and again in the 1960s. Many of those people moved to brand-new developments on former farmland. But in Silver Spring and Takoma Park, which were already established communities at the time, new development took the form of apartment buildings, which often replaced smaller, older single-family homes. These buildings helped meet the demand for new homes, which kept prices down. 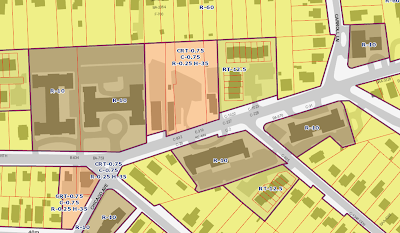 On Sligo Avenue in Silver Spring, you can't build a new apartment building on a vacant lot (in pink) next to existing apartment buildings (in brown). 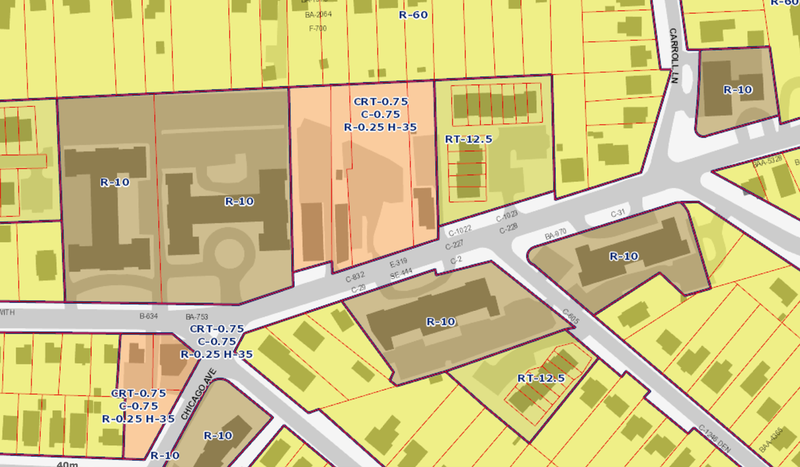 Zoning map from Montgomery County. That largely stopped in 1958, the same year Montgomery County introduced a new zoning code that restricted where you could build apartment buildings outside of the county’s downtowns. The Barbizon, which is a five-story building, sits one block away from downtown Silver Spring on a street with a mix of houses, townhouses, and other five-story apartment buildings. 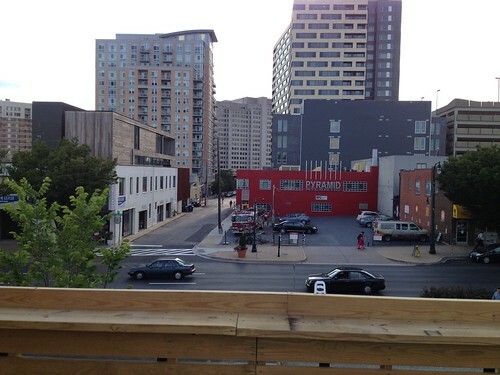 But under the current zoning, you can’t build a new building on Sligo over 35 feet. That means that a building the same size as the Barbizon couldn’t be built on the vacant lot next door. These new luxury apartments are tomorrow's low-cost homes. Photo by the author. 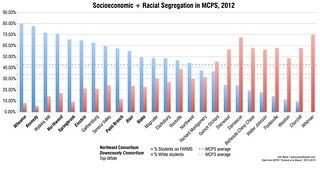 One of the reasons why the people in Silver Spring and Takoma Park are so diverse is because our housing stock is diverse. There are lots of different types of housing, including new buildings and old buildings, that all charge different rents and enable people of all socioeconomic levels to live here. Public subsidies can help lower rents, especially in the short term, since not everybody can wait 60 years for rents to fall. But we also have to build new homes to take the places of older “luxury” homes. When we don’t build enough new homes to meet the demand from people who want to live here, prices continue to rise for everybody. New homes are expensive because they have all of the modern conveniences people like, and that's okay. In a few decades, they'll be the affordable housing of the future, but only as long as we allow that change to happen.